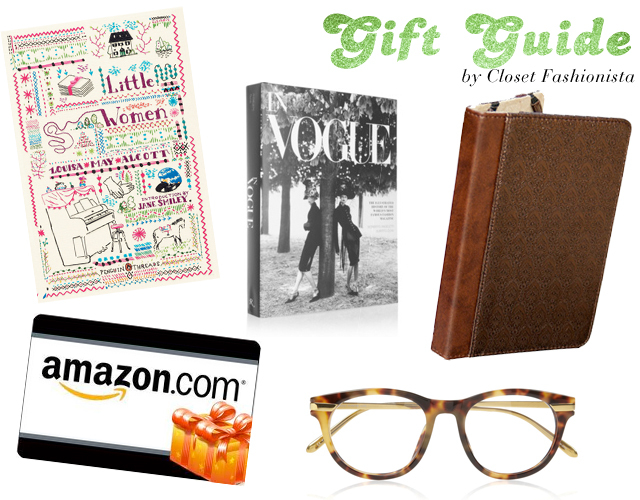 Welcome to my first gift guide of the year! I'm not exactly sure how many I'll be doing, but there will be at least one. ;) This past Friday while I was at Marshalls I found a perfect gift for someone who loves books and thought I should form a gift guide around it! It's a Penguin Threads book; Penguin redesigned some covers of classic books to make it look like they had been sewn on, they also have a really cool texture to them. I picked up a copy of Little Women for myself because it's one of my favorite films and I don't have a copy of the book. I have that Vogue book - and love it! I'd love to get any of these as a gift. Great guide! I really want that Vogue book! Oh, did you find any other books with redesigned covers worth picking up? Love those glasses and the Vogue coffee table book would be a great gift! Such a cute cover of a classic book!! I'm lusting over the In Vogue and those eyeglasses! It's a fun theme for a gift guide - thanks! Great picks. I love the Little Women book. My all time favorite. I personally love giving amazon giftcards and receiving too, lol. Great selections. Love the Vogue book, but I am also wanting that McQueen book. I remember reading Little Women years ago! I need to check and see if I own it. How I don't know this is unclear to me. lol. I'd love to get that Vogue book as a present! Those are wonderful options for the bookworm! I love books with beautiful covers and I want that Little Women for myself! It is one of my favorite books too. ooo i just got that in vogue hardcover book! i havent read it yet but it looks awesome! Hmmm, these are really cute! And I think I'm getting an amazon voucher from my dad for Christmas!